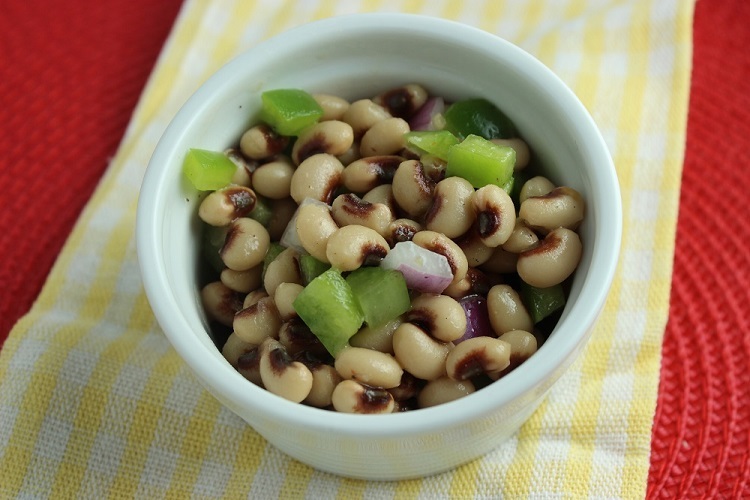 Eating a bowl full of black-eyed peas on New Year's Day is said to bring good luck and prosperity in the new year. However, why save it for just once a year? Black-eyed peas are low in fat and a great source of potassium, calcium, vitamin C, and fiber. With these great nutrients, they just may bring that prosperity to you in the form of good health! Black-eyed peas are actually a bean rather than a pea and can be purchased dried or canned. Like most canned goods, these legumes will have more sodium than their dried counterpart. Look for no added salt and always drain and rinse to wash away 30-40% of sodium. Dried peas have no sodium, but take a little extra time and preparation. First, sort to remove small stones or other foreign objects. Once sorted, place in a colander and rinse under cold, running water. Place beans in a pot and cover with water to soak overnight (3 cups of water for every 1-cup beans.) For a quick soak method, bring 1 cup of beans and 3 cups of water to a boil; boil for 2 minutes. Remove from heat, cover, let stand for 1 hour and drain. Once soaked, simmer for 45-60 minutes until tender and they will finally be ready for devouring! Black-eyed peas are a staple in the south. They're often cooked "low and slow" with generous amounts of bacon and ham. Add rice, and it's generally referred to as "Hoppin John." These southern peas can also be thrown into chili or even gumbo. They're also delicious served cold in a salad or salsa. Head a little south and the word "caviar" may take on a whole new meaning. Sometimes served with chips, this "caviar" is less of a delicacy and more of a simple salad made with Italian dressing. But call it what you want, black-eye peas are a delicious addition to one's plate. Combine all ingredients together in a medium-sized bowl and mix well. Cover and chill before serving.